Our beginner dance classes are a great way to sweat, smile and learn cool moves. Whether you are brand new or a seasoned RSVP 33-er we’ve got a few tips to help you take things to the next level. Whether you are dancing to current hip hop hits or Beyonce, your instructor will teach to lyrics, sound effects, and counts. All of these are reference points and cues for your mind and body to work off of. If you count the music in your head when you’re doing the routine you’ll be able to solidify those cues. And I use the word “count” loosely. You may have learned a “1-2-pow-pow” and it works to say that in your head just the same. When first learning the movement commit to it. Putting tension and strength in your arms as you place them builds the muscle memory. In additional to the better workout, your muscles will get the drill as you repeat. And speaking of repetition — ask us. Need to drill that step? I bet everyone else would love to too. Holla at us with those questions. 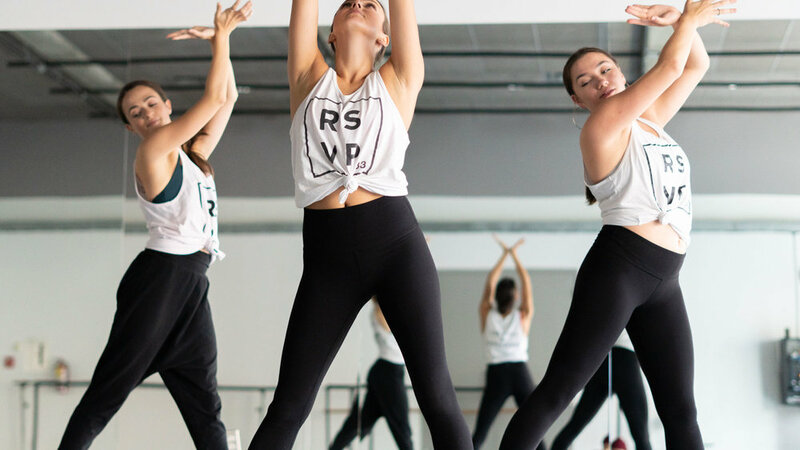 Dance class is all about the process and sometimes we need clarification so we invite you to ask us all the questions. Okay, this is a game changer. Let’s say you’ve already gone over the movement a couple of times, and now you’re repeating and going to do it to music. LOOK AT YOURSELF. First, this will help you mentally process the movements so it’s in your body. You’re no longer relying on a visual cue to execute. Second, it will build your confidence in being able to do the routine. Oh, and you’ll realize how darn cuuuttteee you look in dance class. Smile like Ariana Grande, sing like Beyonce, feel the vibes like Rihanna. This dance class, this hour, is for you and you alone so enjoy that moment. If there’s a sticky section or you miss a quick step, laugh it off, join right back in, and hit the next count that you can. Or freestyle that booty pop or whatever you’re feeling in that moment. BONUS! If you want an extra mental challenge, try jumping into week two classes only so you’ll learn more choreography at once.